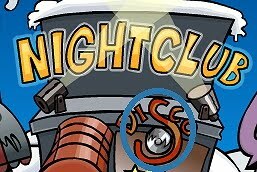 Club Penguin Cheats by Mimo777 Club Penguin Cheats by Mimo777: Club Penguin EPF Agents Report for Assignment...NOW! Club Penguin EPF Agents Report for Assignment...NOW! Awesome! 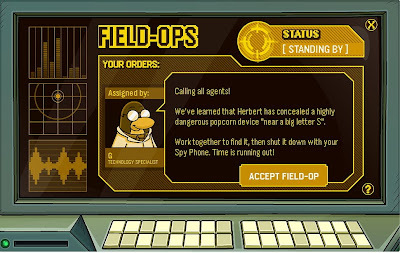 EPF agents report for field ops now! When you log on to Club Penguin, your spy phone will be blinking. Click on it and then click "Accept Field Op." 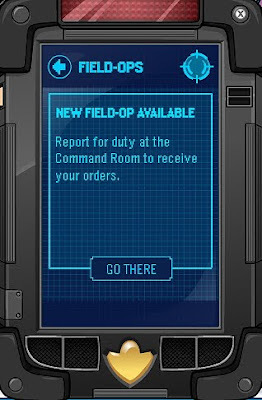 Go to the Command Room and click the Field Ops screen. To find the "Big letter S", go to the Night Club and when you click the "S" in the word Disco your spy phone will ring! When your spy phone rings, click on it. Then, complete the concentration type game and you will earn 1 medal! New Field Ops will be available each week! Saweet! We can earn really cool EPF gear... if you are a member! 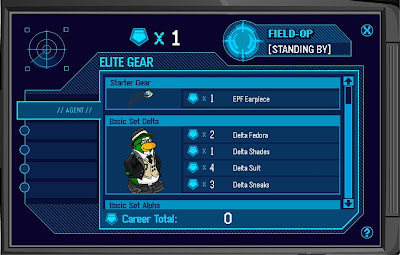 The Starter gear, the EPF earpiece, is for all penguins. All other gear is for members only. Bummer! Did you notice the Herbert statue by the mine? We had to use the statue to plug the geyser in Herbert's Revenge! Kinda weird, though, and now it is covered in vines! Oh yeah, Rockhopper is on his way! Woot! This is so cool! Let me know what you think about the new field ops! I was going to tell everyone how to do it, because I did it right away, but it's fine now! I figured out how to comment!! I went everywhere with an S until I saw the big group of people. I was like "oooh the big letter S!!" What is with the Herbert statue at the mine though? I thought I could do it myself with the clues but I was lost! And at the time Mimo hadn't posted it yet so I was totally lost. We are so fortunite to have someone like Mimo post cheats. Can't wait to go online! After you click the letter "s" click yur EPF Spy Gaget and follow the on-screen instructions. It was VERY short and easy but Club Pengui has been working REALLY hard lately and it was our first mission so I wasn't expecting much. I had to look here first...before I figured out the big 's'. I'm like okay, we have to many 's's in club penguin...lol. I was expecting a free pizza as a reward. Oh well. I can pay for one... Lol. Lol Finally Cp, Thanks For Updating! If you are a nonmember you can get the ear piece only but you can't really see it so its a waste. this is so awesome! and with those medals can non-members finally get good stuff (for buying stuff press the medal on your spy phone) waddle on and keep posting the good work, Mimo! The new DS game tells you. You had to use it to plug up a geyser Herbert made. Cool. I wonder if anyone got the shades. I got the ear piece. Pretty cool. Lol. I thought it might have been in the Stadium or Snow Forts. I wonder what we will have to do next week. Did anyone notice that the music to the play Ruby and the Ruby has changed to the music from Quest for the Golden Puffle? Weird huh? Check it out! Im sure it won't be there for long. i love the new feild-ops. and rockhopper on his away...SWEET!i love trying to meeet him! Same, i thought it was the S in gift shop! I love the new field ops! Hey Mimo did you see the new sculpture in the Mine Shack. I finished the Field-Ops without even thinking of using your website. I like how non members can do it too.It is so cool how both non members and members can get the new clothes. The feild op was rele easy but in a way it is good cuz its easyer to get the medals. I wished i saved mine up. Yea he did. You can see why thats there from the new DS game. We had to plug up a certain hole caused by one of Herbert's inventions. I love them too. I like how we get to do little puzzels. By the way, who are you again? Lol, Just kidding. Waddle On! I love meeting him too. I go to different servers rapidly. 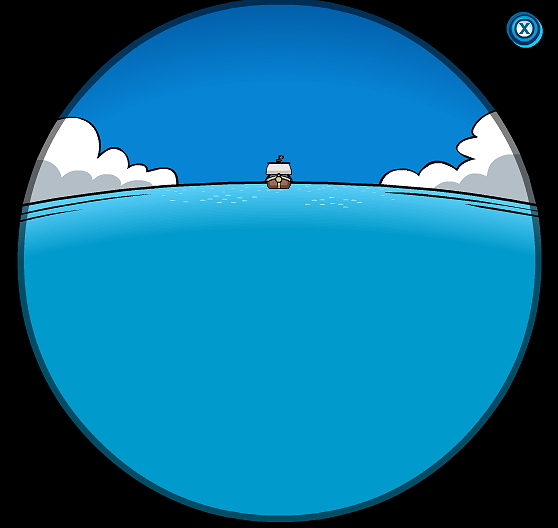 I will find you Rockhopper! Yea, that came out during the earth party a couple months ago. He posted about it. Keep looking for more! The little puzzle in the Field Ops mission? What you do is match up the shapes on the red dots. The're two sets of shapes you have to find by going over the red dots with the mouse. Click all the matches. Good luck! mimo please give me credit because i am commenting first! PLEASE! the stage music bug is back, it is playing the quest for the goldon puffle music! PLEASE give me credit! OMG my concert of my schools band is today wish me luck guys!!!! and allso nice mimo thanks! mimo mimo glitch alert! at the stage cp is playing the music 4 quest 4 the golden puffle! not the music 4 ruby and the ruby! I know! without mimo i would still be looking for the S! the missions weren't worth keeping my membership. When I have enough medals for the stuff I want im quitting my membership. OOHH, sound fun! gonna try it now! Oh, thanks for the cheats Mimo! Always helpful! I don't don't know if field ops are a good thing because this might mean no more missions!!!! Where do you put on the ear piece?? hey mimo at the stage they have the wrong music they have the quest for the golden puffle music. Yea weird huh? Maybe the stage manager didn't get much sleep last night or something. Head items. I thought that was odd. I checked neck items first then face items then head items. Funny. The music is also wrong. It's the Quest for the Golden Puffle music. Weird. It is fun. Good luck! Maybe. Im curious if that statue is going to stay permanently from now on. We used it to clog a geyser made by Herbert in the DS game. I guess we're going to have to find out. Good luck! Have fun! And remember to save the cookies for afterward! Special Ops is totally awesome. Can't wait till I get some more badges so I can get the other gear. Thanks Mimo! Yea its always done that. Maybe Gary invented a pizza plant seed or something. Remember, this was only the first one. They will probably get better in the future. You have to stand next to the S.
hahaha scamper i think the yellow puffle at the stage fell on a lever on accident. I got the earpiece and I am a member. I thought it would be alot better and more noticeable too! I can understand your point! If you click one of the red dots on the board a shape will appear on the dot. You need to match the two dots that have simular shapes. Even once you quit your membership you can't put the clothes you purchased with your medals on. The EPF outfits are strictly for members and only members who have on going memberships. Me too. I hope we can unlock more stuff in the future. Im hoping we can unlock the rest of the Elite Puffles. 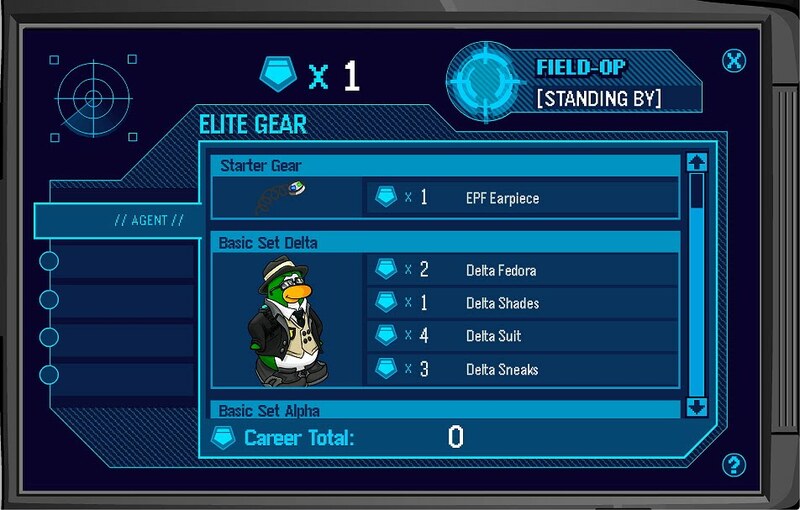 can u wear the epf gear? Seriously! On Twitter everyone went absolutely INSANE... Lol! You have to walk to it! Then your spy phone rings, you answer it, and complete the deactivation! All in a day's work. 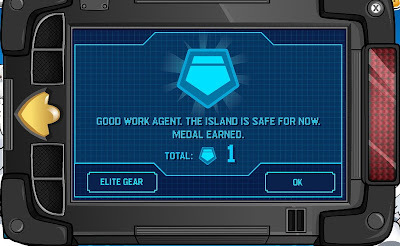 I was expecting more too, but the EPF Gear is awesome! Plus, CP is obviously busy! I'm saving up for the Delta Suit! I hope we get more gear! Looks like we have a new mod! That's so cool, man! LOL. Twitter went crazy at the "one second late" mark. I am so glad it didn't take too long! Thanks CP! If you do see it it's pretty phunnie! I stole Mimo's word, LOL, sorry Mimo. Mimo, you inspired me to make my own blog so I did just today. I am glad I got to know your blog. Thank you. You have to click on your spy phone again, the light on it will be green. That test was awesome! Good luck everyone! Mimo! Check your pins and it will show that you dont have the ruby pin! I tried getting it but it said Would you like to buy undefined for undefined coins? You currently have _____ coins. I press yes and it wont work! Help me! Wow, nice dude. How did you do it? yes thank i got it! thx mimo for the cheats! you are great! It rocks!! The field ops is really cool!! the i pad looks like the epf gadjet. I like the PSA better. Much more simpler. I also like the Sport Shop better. This is all *too* high tech for me. And, I liked how the missions were. If they needed money, I would've gladly donated my coins! This is towards Mpl000: It IS near the night club! Finally, ive been waiting for the task. Hi Anonymous! You're right, that kinda stinks, but at least non members get something! I hope they will be able to get more soon. Awww, your too smarticle! I had to use it. I am a stupid penguin! I think they can only get the earpiece! But still, that's awesome! No kidding! It took forever! Technically it is! It's on the Night Club Wall! You go near it. You don't click it. I know. That was really short. I was thinking it would be longer. I think someone else might have said that, but if not, GREAT JOB! That is really weird! There is the music from the Quest for the Golden puffle at the Stage, not the Ruby and the Ruby music! It's so weird! There are tons of glitches in the Stage! That's what I think! Or maybe someone gets lost in the Adventure Party and it is one of those good ol' rescue missions! But then you won't be able to wear the stuff, you know! I think some things are definitely worth a membership! Mimo777 is always helpful! And he's a pretty awesome cheater, LOL! Wow! As some british person would say (no offense no England/Great Britain), how peculiar! Aww, you're probably right! :( But I bet eventually the Field Ops will grow really long! You go to your inventory and put it on! You must turn your penguin to see it!It's on the right side of your head. A few ppl have noticed that! Weird, isn't it? It WAS kinda short! I hope it will be longer next week! I really want all of the Delta Gear! But I think there will be more, because on the side it says "Agent:", and the other rows are blank! So maybe we can go up EPF ranks! Yup, then your spy phone rings and you complete the game! :O Someone else said that, but this proves it! Good job! Yeah, it's so weird! Must be a glitch! Just go to your inventory! It's pretty hard to see, though. If you go in the new HQ and go through the tube transport, the old missions are at the bottom, right hand corner. Or you could walk up to the big machine that says PSA missions. Hope that helped! Well in herberts revenge u use it to plug a gyser at the mine shack so thats what i think. glad i could help! there are wires everywhere. you click on one of the red things and change its color. then follow the wire and click the one that connects. do this with all of them to win! They are in the VR room. 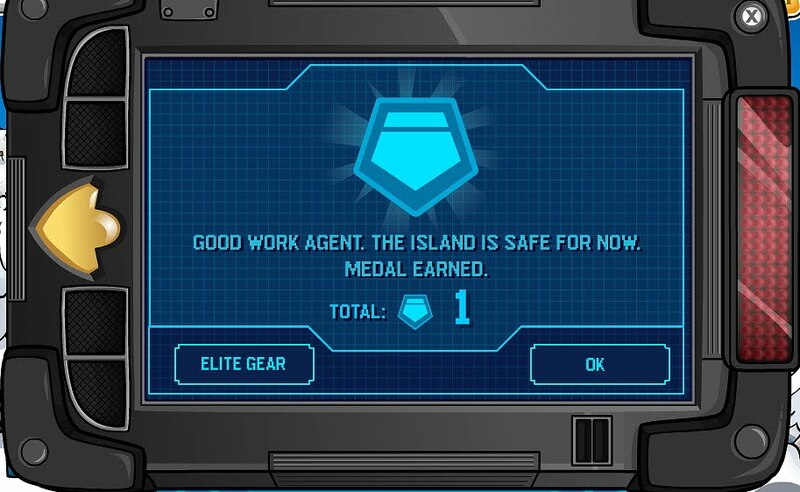 i am hoping they will continue to be made like that for the epf because so far these feild ops are to easy. i dont know if u noticed this but there is a red puffle on the mast - that means rockhopper must have yarr! u just got to keep clicking it a lot and your epf spy gadget will flash green, then when you click on it u just have to disable/enable it. 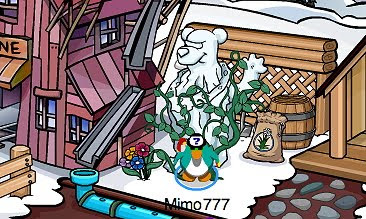 mimo.maybe thats where the water flood is!once you think about it its in thee EXACT same place as in the game.the vines probaly where there because its there for a long time.this may lead to something maybe the statue will be removed then..WATER PARTY!!!!!! Keep clicking it. It worked for me. spoiler alert: at the end of herbert's revenge herbert uses it to plug a geyser he made. I wonder what HE is up to right now. The field ops were fun! i think that this will make the agents happier! 1. Go to the EPF Hq. 2. Go inside the VR room Tube thing. 4.When your penguin dissappears you will still see the speech bubble. I just think it's cool.